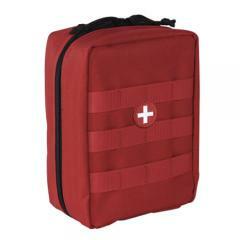 The enlarged version of Voodoo Tactical's popular EMT Pouch provides extra space for emergency supplies without compromising its industry-leading convenience and portability. The universal straps attach to MOLLE-webbing and other web platforms, allowing it to fasten effortlessly to vests, bags, belts, chest rigs and other compatible tactical gear. Two-way silent zippers provide access to the interior compartment, which features assorted elasticized hold-down webbing to keep medical equipment organized and secure during transport. The addition of metal drain grommets ensure liquids escape, instead of building up and potentially damaging medical contents.